Homes along old Highway A1A in Summer Haven, Florida. Photo courtesy St. Johns Public Works. The McHarg Center—a new research initiative that will study the intersection of urbanism and ecology—is dedicated to studying how “urban growth and all of its related infrastructure can relate better and be better tuned to ecosystems,” says Richard Weller, ASLA, chair of the landscape architecture department at the University of Pennsylvania. The center is awaiting its formal launch next year with an exhibition, book, and conference timed to the 50th anniversary of Ian McHarg’s seminal book Design with Nature. In the meantime, the center, housed within PennDesign, has invited Jeff Goodell, the author of The Water Will Come: Rising Seas, Sinking Cities, and the Remaking of the Civilized World (Little, Brown, and Company, 2017), to visit for an inaugural lecture on March 29, at 6:00 p.m. in the lower gallery of Meyerson Hall. Improbable Botany. Illustrations by Jonathan Burton. Published/Curated by Wayward. 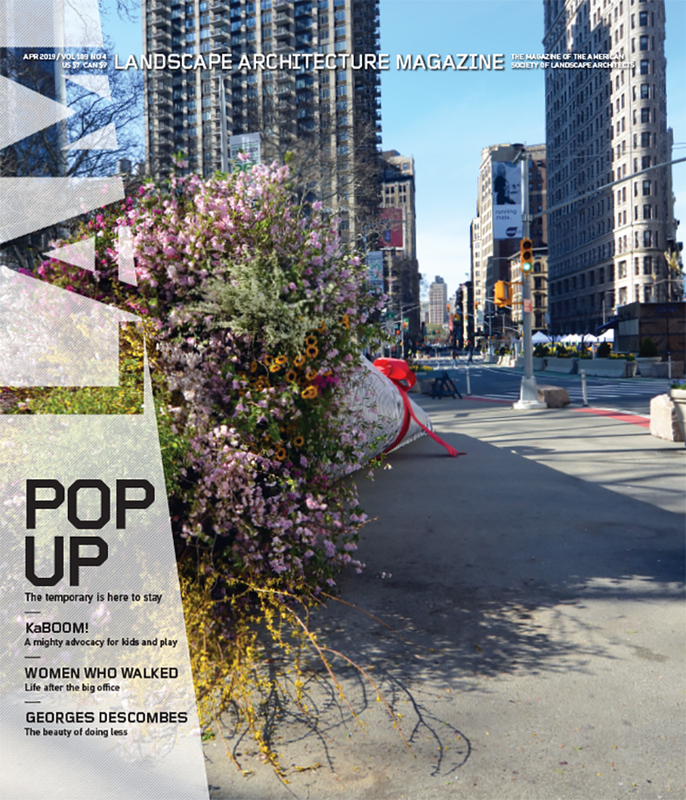 Wayward is a collective of landscape architects, architects, urban growers, artists, and other assorted creative types who design landscape installations for “exploring new models for how green space can work in cities,” says its founder, Heather Ring. The group’s experimental and often temporary projects emphasize creating “narrative environments that tell stories through the spaces.” The projects have included chromatic explorations of algae growth and weaving slow-growth sculpture from living trees. It’s an outsider’s perspective on landscape design that might have earned Ring’s London-based band of designers the high school graduation accolade of “landscape architect most likely to commission a science fiction anthology,” because that’s just what Wayward has done. Johanson grants herself the opportunity to try it both ways. Her Ellis Creek Water Recycling Facility in Petaluma, California, clocks in to perform all the progressive landscape-as-infrastructure functions asked of it. It’s a sewage treatment plant, and a park with three miles of trails whose wetlands help filter and clean Petaluma’s water. It’s also a wetland wildlife habitat where visitors set up easels and sketch the landscape, part of which playfully resembles a mouse (with two beady little eyes that are islands in a pond) from above. Molly Meyer is capitalizing on a surge in demand. From the July 2015 issue of Landscape Architecture Magazine. 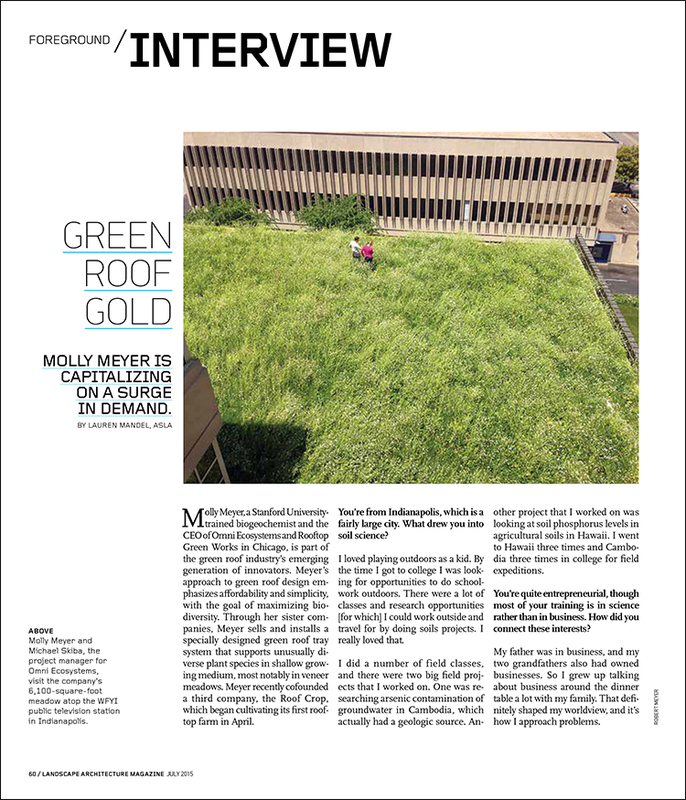 Molly Meyer, a Stanford University-trained biogeochemist and the CEO of Omni Ecosystems and Rooftop Green Works in Chicago, is part of the green roof industry’s emerging generation of innovators. Meyer’s approach to green roof design emphasizes affordability and simplicity, with the goal of maximizing biodiversity. Through her sister companies, Meyer sells and installs a specially designed green roof tray system that supports unusually diverse plant species in shallow growing medium, most notably in veneer meadows. Meyer recently cofounded a third company, the Roof Crop, which began cultivating its first rooftop farm in April. You’re from Indianapolis, which is a fairly large city. What drew you into soil science? In late November, the University of Pennsylvania named the new chair of its landscape architecture department: the Australian landscape architect Richard Weller. The previous chair, James Corner, ASLA, had led the department since 2000 and will continue to be a professor there. I recently caught up with Weller on his wife’s cell phone and asked him about his plans for the department. What follows is an edited and condensed version of the conversation. Is there a reason why you don’t have your own cell phone? To be honest, I just don’t like telephones. I just thought that was sort of intrusive—you randomly ring up people and dial into their lives. I prefer email. What drew you to the landscape architecture department at the University of Pennsylvania? There has been a sequence of people at Penn who have been very influential and led the academic discipline. Penn’s always been front and center. What drew them to you? I have had an intellectual relationship with some of the people there going back to John Dixon Hunt. I’ve written about Jim Corner’s work. Penn’s Press published my first book, called Room 4.1.3: Innovations in Landscape Architecture, which was a very risky book because it was so conceptual. I’ve done work that tracks the entire spectrum of what a landscape architect can do. I’ve done the smallest gardens that are all about meaning and allegory all the way to large scale planning. It’s always been about what is in this project that will critically make some contribution to the discipline. Of course, the short answer is that there’s not that many people around, either. What do you hope to do with your new position as chair?